Instagrille showcases your Instagram feed beautifully, with little extra chrome. Facebook-owned Instagram needs little introduction: This mobile photo-sharing service has taken the world of shutterbugs by storm, with tens of millions of users enthusiastically snapping and sharing. But while Instagram has official apps both for iOS and Android, the service does not offer an official Web or desktop interface. If you want to view Instagram photos on the desktop, you need to find your own solution—perhaps something like Instagrille, a free, slick application for browsing Instagram. Instagrille is an interesting mashup between a desktop app and a Web app, and runs in its own window, using a free platform called Pokki. It won't let you post new photos to Instagram, but you can browse popular photos, nearby photos, and your timeline (if you log in). You can click on a photo to see a larger version of it, too. 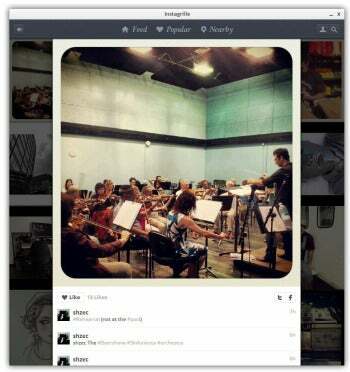 Instagrille's single-photo page is resizable, and lets you participate in the conversation. Logged on, you can do most things you can do on your phone: Follow users, Like photos (by double-clicking them, just like double-tapping on the phone), comment on photos, and share them on Facebook and Twitter. Clicking the Share buttons pops up Twitter or Facebook in a built-in dialog, which you then use to share the Instagram link. Instagrille also lets you save individual images to your hard drive as 612 by 612 pixels-large PNG files. The notable omission is posting new photos, something Instagrille does not let you do. 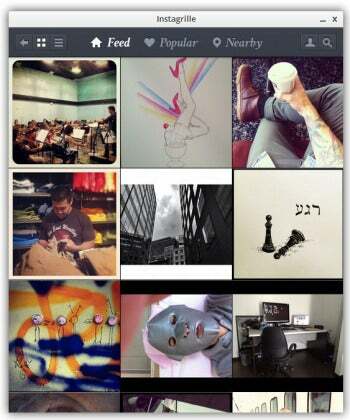 Instagrille offers a fun and compelling way to enjoy your Instagram feed without reaching for a smartphone. If you're constantly draining your phone's battery oohing and aahing at your friends' beautiful photos, Instagrille can be a nice way to view that virtual art gallery on a bigger monitor. Use this hybrid between a Web app and a desktop app to browse Instagram photos on your PC.